Alfred Merrill "Al" Worden (born February 7, 1932), (Col, USAF, Ret. ), is an American astronaut and engineer who was the Command Module Pilot for the Apollo 15 lunar mission in 1971. He is one of only 24 people to have flown to the Moon. The son of Merrill and Helen Worden, Worden was born February 7, 1932, in Jackson, Michigan. Worden attended Dibble, Griswold, Bloomfield and East Jackson grade schools and completed his secondary education at Jackson High School. Worden was a Boy Scout and earned the rank of First Class. Worden received a Bachelor of Science degree in Military Science from the United States Military Academy at West Point, New York, in 1955, and Master of Science degrees in Astronautical/Aeronautical Engineering and Instrumentation Engineering from the University of Michigan, in 1963. He also received an Honorary Doctorate of Science in Astronautical Engineering from the University of Michigan in 1971. Worden graduated from the U.S. Military Academy in June 1955 and, after being commissioned in the Air Force, received flight training at Moore Air Force Base, Texas; Laredo Air Force Base, Texas; and Tyndall Air Force Base, Florida. Worden attended Randolph Air Force Base Instrument Pilots Instructor School in 1963 and served as a pilot and armament officer from March 1957 to May 1961 with the 95th Fighter Interceptor Squadron at Andrews Air Force Base, Maryland. Prior to his arrival for duty at the Johnson Space Center, Worden served as an instructor at the Aerospace Research Pilots School from which he graduated in September 1965. He was also a February 1965 graduate of the Empire Test Pilots' School in Farnborough, England. Worden has logged more than 4,000 hours flying time, including 2,500 hours in jets. Now I know why I'm here. Not for a closer look at the Moon, but to look back at our home, the Earth. —  About his feelings during Apollo 15. Worden was one of the 19 astronauts selected by NASA in April 1966. He served as a member of the astronaut support crew for the Apollo 9 flight and as backup Command Module Pilot for the Apollo 12 flight. Worden served as Command Module Pilot for Apollo 15, which flew from July 26 to August 7, 1971. His companions on the flight were David Scott, spacecraft commander, and James B. Irwin, Lunar Module Pilot. Apollo 15 was the fourth manned lunar landing mission and the first to visit and explore the Moon's Hadley Rille and Montes Apenninus which are located on the southeast edge of the Mare Imbrium (Sea of Rains). Apollo 15's achievements include the largest payloads placed in Earth and lunar orbits at that time, the first scientific instrument module bay flown and operated on an Apollo spacecraft, the longest lunar surface stay at that time (the Apollo Lunar Module, Falcon, remained on ground for 66 hours and 54 minutes), the longest lunar surface EVA at that time (Scott and Irwin logged 18 hours and 35 minutes each during three excursions onto the lunar surface), the longest distance traversed on lunar surface at that time, the first use of the Lunar Roving Vehicle, the first use of a lunar surface navigation device (mounted on Rover-1), the first subsatellite launched in lunar orbit, and the first EVA from a command module during transearth coast. Additionally, Worden has been listed in the Guinness Book of World Records as the "Most isolated human being" during his time alone in the command module Endeavour. When the orbiting command module was at its greatest distance from Scott and Irwin in the Falcon, Worden was 2,235 miles (3,597 km) away from any other human beings. 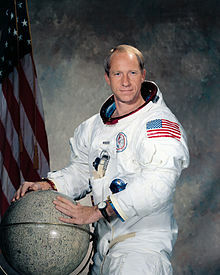 Worden said he enjoyed his "three wonderful days in a spacecraft all by myself", including not communicating with Earth while on the far side of the Moon, because he was used to being alone as a fighter pilot. Worden (age 39) performing humanity's first deep-space EVA during Apollo 15's homeward journey (1971). Scott and Irwin collected approximately 171 pounds (78 kg) of lunar surface materials on their three expeditions onto the lunar surface, and Worden logged 38 minutes in extravehicular activity outside the Command Module Endeavour. In completing his three excursions to Endeavour's scientific instrument module bay, Worden retrieved film cassettes from the panoramic and mapping cameras, performing the first deep-space EVA, and reported his personal observations of the general condition of equipment housed there. Apollo 15 concluded with a Pacific splashdown and subsequent recovery by USS Okinawa. In completing his space flight, Worden logged 295 hours and 11 minutes in space. Although the astronauts were allowed to choose the design for the patch, they were not allowed to put on the Roman numeral for 15 ("XV"). They got around this technicality by adding it to the Moon's surface in the background. During 1972–1973, Worden was Senior Aerospace Scientist at the NASA Ames Research Center, and from 1973 to 1975 he was chief of the Systems Study Division at Ames. Between 1972 and 1975, he made seven guest appearances on Mister Rogers' Neighborhood. After retirement from NASA and active duty in 1975, Worden became President of Maris Worden Aerospace, Inc., and then became staff Vice President of Goodrich Aerospace in Brecksville, Ohio. Worden served as Chairman of the Astronaut Scholarship Foundation until 2011, providing scholarships to exceptional science and engineering students. Worden is the last of the Apollo astronauts to have participated in the Kennedy Space Center's "Encounter with an Astronaut" program. In 2011, Worden's memoir Falling To Earth made the top 12 of the LA Times Bestseller list. In 2017, Worden was also a contributor and wrote the foreword for the award-winning book A Quarter Million Steps by Dr. Anthony Paustian that looks at leadership using perspectives from the Apollo Program. After the return of Apollo 15 to Earth, it was discovered that, without authority, the crew had taken 398 commemorative postal covers to the Moon. Of these, 100 were then sold to a German stamp dealer. The profits of the sale would have been used to establish trust funds for the crew's children. Although their action was not in any way illegal, and despite the fact that NASA had turned a blind eye to similar activities on earlier flights, NASA administration decided to make an example of Scott and his crew and none of them flew in space again. In an interview on the TV show Good Morning Britain (aired September 29, 2017), Worden defended himself over the stamp incident, saying that his commander had brought the stamps, not him. On the same program, when asked "Do you believe there's extraterrestrials out there? ", he responded by claiming that all human beings are aliens that came to Earth from space, a claim he stated was supported by the beliefs of the Sumerian culture. "I thought that was a very important thing to do. I put everything into it and lost, but that is okay." Worden received the NASA Distinguished Service Medal in 1971. He was inducted into the International Space Hall of Fame and U.S. Astronaut Hall of Fame in 1983 and 1997, respectively. In 2018, Worden joined the Back to Space organization as an Astronaut Consultant with the goal of inspiring the next generation to go to Mars through film. In 2016, Worden was inducted into the International Air & Space Hall of Fame at the San Diego Air & Space Museum. Worden married Pamela Vander Beek, whom he met on a blind date while a cadet, in June 1955. The couple divorced in December 1969, 14 years later, just before Worden was selected to fly on Apollo 15. Worden married Jill Lee Hotchkiss in July 1982. She died on May 4, 2014. Worden has three children, Tamara Christians, Merrill Bohanning, and Alison Penczak. His recreational interests include bowling, water skiing, golf and racquetball. In the 1998 HBO miniseries From the Earth to the Moon Worden was played by Michael Raynor. Worden wrote the poem "Apollo Lost" in response to the cutbacks in the US space program. It was set to music by Cynthia McQuillin. Other poems by Worden have been published, and some have been set to music by Dov Rosenschein. Worden contributed the foreword to the space history book To A Distant Day by Chris Gainor. ^ a b c d e f g h i NASA (1993). "Alfred Merrill Worden". National Aeronautics and Space Administration. Archived from the original on 30 October 2007. Retrieved 2007-10-31. ^ "Scouting and Space Exploration". scouting.org. Archived from the original on March 4, 2016. ^ a b "International Space Hall of Fame :: New Mexico Museum of Space History :: Inductee Profile". nmspacemuseum.org. ^ Thompson, Ronald (April 5, 1966). "19 New Spacemen Are Named". The High Point Enterprise. High Point, North Carolina. p. 2A – via Newspapers.com. ^ "Preparations for Launch". NASA. Retrieved 2017-12-29. ^ "Apollo 12 Crew". Smithsonian National Air and Space Museum. Retrieved 2017-12-29. ^ "Apollo 15 Crew". Smithsonian Air and Space Museum. Retrieved December 29, 2017. ^ "Landing Site Overview". Lunar and Planetary Institute. Retrieved December 29, 2017. ^ Hollingham, Richard (2013-04-02). "Al Worden: 'The loneliest human being'". BBC. Retrieved 2014-12-22. ^ a b Valare, Sherry (July 2015). "Al Worden on the honor of being an astronaut". RocketSTEM (13): 14. ^ "The Space Review: Review: Falling to Earth". thespacereview.com. ^ Worden, Alfred (September 16, 2014). Worden Speech on Apollo 15 Patch (Speech). Limerick, Ireland. Retrieved 2017-12-31. ^ "Sept. 11, 2011". latimes.com. ^ Paustian, Anthony (2017). A Quarter Million Steps: Creativity, Imagination, & Leading Transformative Change. Bookpress. ISBN 9780996442893. ^ "Boca Raton News - Google News Archive Search". google.com. ^ "Apollo's most controversial mission". cnn.com. ^ "Al Worden". Astronaut Scholarship Foundation. Retrieved 2017-12-29. ^ "Back To Space | The Team". Back To Space. 2018-02-05. Retrieved 2018-07-24. ^ "Al Worden - Apollo 15 CMP - Welcome to AlWorden.Com". alworden.com. ^ "Filmography". IMDb. Retrieved 2017-11-29. ^ "To a Distant Day - University of Nebraska Press". unl.edu. Wikimedia Commons has media related to Alfred Worden.